DLK’s Liquid Facelift Treatment is a safe and effective solution for people who want to treat the lines around the eyes, forehead and mouth and to restore fullness of the cheeks, lips and chin. This treatment creates a balanced and natural-looking makeover in just one session and is an effective treatment at any age and addresses multiple signs of aging. The effect is balanced, subtle and entirely natural looking. Safe and effective treatment of lines and wrinkles. Immediate results that last up to 12 months. The entire procedure takes approximately 40-60 minutes. One component is a purified protein that relaxes muscles and smooths away wrinkles and has a well established safety history and is used to treat horizontal forehead lines, frown lines between your eyebrows and crow’s feet around your eyes, creating a more relaxed and refreshed appearance. A safe and effective injectable gel is used to instantly improve appearance by smoothing lines, wrinkles and restoring lost volume for up to a year. Made from Hyaluronic acid, a sugar naturally found in the skin, this is used to smooth away the lines around the nose and the mouth, to enhance lips and to restore lost fullness to the cheek and chin areas. DLK’s Liquid Facelift Treatment addresses these signs of aging for smooth, natural-looking results with no downtime, in just one treatment session. The day of your appointment. Please allow time before your appointment for filling out forms and for consultations if making your initial appointment. 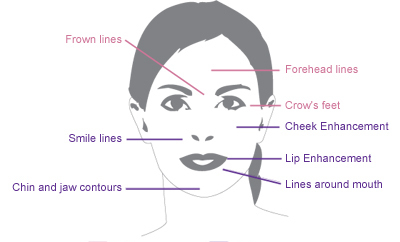 Injections are administered using a tiny needle into the various facial muscles and areas that create wrinkles. You will be lying down during the treatment. No anesthesia is required, although our Doctor or Registered Nurse may choose to numb the area with a cold pack or anesthetic cream. You will see results within days, and wrinkles, lines and volume continue to improve for up to a month, and can last for up to 12 months. After treatment there will be some mild redness which lasts less than an hour. Rarely, there can be a slight headache or some minor bruising and swelling. Most patients return to regular activity immediately. Sleeping or strenuous exercise should be avoided for 4 hours after injection. You should contract your frowning muscles 3 times every 10 minutes for the first hour after treatment. Do not rub or massage the treated areas for 24 hours after treatment.